Здесь вы можете прочитать биографию Иосифа Сталина на английском языке. Joseph (Iosif) Stalin (09. (21).12.1879 - 05.03.1953) - Leader of the Soviet Union. Stalin became general secretary of the Soviet Communist Party in 1922 and following the death of Vladimir Lenin, he prevailed over Leon Trotsky in a power struggle during the 1920s. 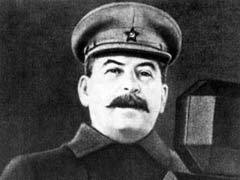 In the 1930s Stalin initiated the Great Purge, a period of severe repression that reached its peak in 1937. Stalin is generally considered to have molded the features that characterized the Soviet regime from the era of his rule to its collapse in 1991 — though Maoists, anti-revisionists and some others say he was actually the last legitimate socialist leader in the Soviet Union's history. Stalin's policies were based on Marxism-Leninism but are often now considered to represent a political and economic system called Stalinism. Stalin replaced the New Economic Policy (NEP) of the 1920s with Five-Year Plans in 1928 and collective farming at roughly the same time. The Soviet Union was transformed from a predominantly peasant society to a major world industrial power by the end of the 1930s. Confiscations of grain and other food by the Soviet authorities caused or aggravated a famine killing millions throughout the country between 1932 and 1934, especially in Ukraine (see Holodomor). Many peasants resisted collectivization and grain confiscations, and Stalin ordered violent repression against peasants deemed "kulaks." A hard-won victory in World War II (the Great Patriotic War, 1941–45), for which the Soviet Union was arguably unprepared due to Stalin's massive purges of military officers before the war, was made possible in part through the capacity for production that was the outcome of industrialization, as well as significant Lend-Lease efforts by the Western Allies. In the postwar years, Stalin laid the groundwork for the formation of the Warsaw Pact and established the USSR as one of the two major world powers, a position it maintained for nearly four decades following his death in 1953. Stalin's rule was characterized by a strong cult of personality, an extreme concentration of power, and little concern for the harsh consequences of strict policies. Stalin tried to crush all opposition by commencing a bureaucratic network of terror that resulted in tens of millions of deaths. In addition to the purges and the famine, many were killed in the Gulagss. Lasting over a period of nearly twenty three years, many of its proponents fell victim to it in turns. Nikita Khrushchev, Stalin's eventual successor, denounced his mass repressions and cult of personality in 1956, initiating the process of "de-Stalinization" which later became part of the Sino-Soviet Split.